MPPEB Jail Prahari Result Check Here. MPPEB Jail Prahari Answer Key 2018 Check Here. MPPEB Jail Prahari Stage II Physical Exam Schedule Check Here. MP Jail Prahari Admit Card 2018 Check Here. MPPEB Notification is out. MPPEB is recruiting for 475 Jail Prahari Post 2019 Posts. You can check MPPEB - Madhya Pradesh Professional Examination Board last date, download MPPEB notification, visit MPPEB official website and check other MPPEB Vacancy details.Complete Vacancy and recruitment Details about 475 Jail Prahari Post 2019 vacancies in MPPEB are provided below by JobSarkari.Com only for you. Last Date for Apply Online 25/08/2018. Last Date for Payment of Application Fees 25/08/2018. Last Date for Correction in Application Form 30/08/2018. Date of Examination 29/09/2018 to 30/09/2018. Mode of Payment Application Fees Can be Submitted through Online Mode or offline at E-Kiosk. Jail Prahari 238 66 76 95 475. 165 cms. 158 cms. 83 cms After Expansion 88 Cms. 1.Written Test (Objective Type) 100 Marks. 800 Meter Race 02 Minutes 50 Seconds. 04 Minutes. 03 Minutes 15 Seconds. Shot Put 20 Feet(Weight of Gola - 7.260 Kg). 16 Feet(Weight of Gola - 4.00 Kg). 15 Feet(Weight of Gola - 7.260 Kg). 6.Online Application Can be Submitted on or Before 25th August 2018. Q. 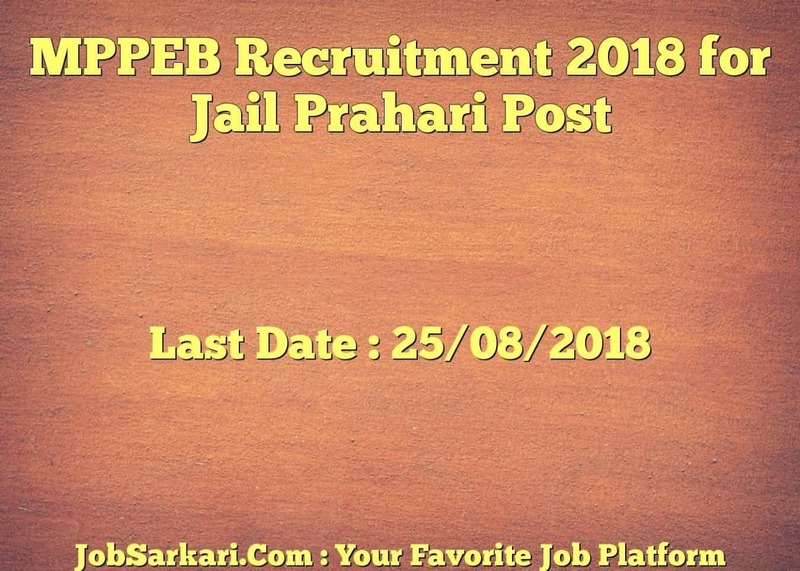 What is the Last Date For MPPEB Jail Prahari Post 2019 Vacancy ? A. Last Date for MPPEB Jail Prahari Post 2019 Posts is 25/08/2018. Q. What is the Form Type of MPPEB Jail Prahari Post 2019 Recruitment ? A. The Form Type for MPPEB Jail Prahari Post 2019 Posts is Online. Q. How many vacancies are available in Madhya Pradesh Professional Examination Board Jail Prahari Post 2019 Posts ? A. There are about 475 Vacancies in Madhya Pradesh Professional Examination Board Jail Prahari Post 2019 Posts.